It’s here! 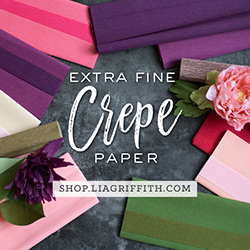 I finally launched my crepe paper Foxgloves Online Course. This post is a few days late, after I realized that I never actually posted about this on my blog. Oh man, I think I’m going crazy. With so many social media outlets to keep up with nowadays, I’ve completely lost track of this outlet. I literally just uploaded a link to the course on Facebook. • Assembling the buds and blooms in a natural spire shape. It’s my favourite flower to include in my arrangements when I need an element that draws my eye up or in a certain direction, and when I’m looking to emphasize more organic style. So I hope you’ll start incorporating it into your arrangements too. After teaching this flower at one of my workshops, I sought to improve my techniques so it was better suited to all levels of paper flower enthusiasts. I saw how some of my students struggled with the petal details and so in this course, I tried to address the underlying issue. I have to thank those of you who attended my Foxgloves Workshop at The Paper Place back in May. For those of you who attended the in-person workshop, please contact me via email or DM – I’d love to send you a code so you can get free access to the online course! I don’t say this for most of my flowers, but I think you’ll find that you’ll be able to get consistently stunning results with this tutorial because my instructions and demonstrations are so clear. As well, if you purchase my crepe paper Foxgloves Online Course, you’ll also receive a 15% discount to my Distant Drums Rose Online Course too. This is a limited time offer, so if you’ve been thinking of enrolling in my Distant Drums course, here’s your chance to enrol in 2 of my classes at a discount!